We're all for renovators improving property for resale and putting a profit in their pockets, but sometimes they shoot themselves in the foot by making poor design choices that are too taste-specific or, sigh, their workmanship is poorly executed. This compels us to rant, occasionally. In a past blog called We Flip Flapjacks, Not Houses, our rant was over the ubiquitous presence of fixtures and fittings sourced from major big box building stores. In fact, in the house we featured we figured the engineered wood flooring, staircase, carpeting, hardware, tiles and lighting may very well have been chosen during the flipper's single visit! Despite being all new and in move-in condition, the material choices were completely devoid of personality. 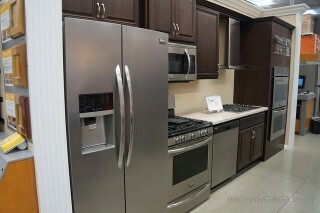 It felt like Home Depot exploded and the model kitchen from the in-store display shot through the air and landed in the note. Take note, Buyers are willing to pay a premium for a custom look. This is not custom. This is ubiquitous. Thanks to mommyGAGA.com for letting us post your pic! Another huge pet peeve of ours is recessed lighting overkill. 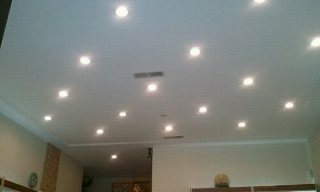 In a past blog called We Flip Houses, Not Burgers, we counted 32 recessed lights embedded in a ceiling with dimensions of approximately 14x34 feet! Worse, there was not a single dimmer switch to be had. With that amount of wattage, the interior looked like a Walmart Parking lot at night. Today's rant is another crime of taste and indecency. 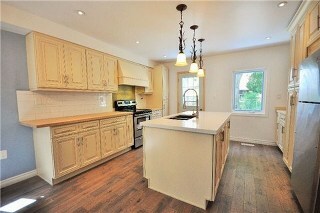 It costs at least $700,000 to buy a three bedroom flip in downtown Toronto today. The house will not be large, detached and may even lack a parking space, but it will offer an opportunity for a professional couple entree into the freehold housing market in a reputable school district. These urban educated Buyers are sufficiently well-informed - if only by the 24 hour loop of houseporn on HGTV that any homebuyer can't help but watch - to know what constitutes good design and bad design. They have the capacity to see flaws - both in execution and finishing choices - which, if minor they're prepared to remedy, and when not, they quite rightly are entitled to throw up their arms in disgust. Take note, Buyers do not want to pay top dollar to rip out newly installed bad design. The just-completed crapbox I showed recently featured an open concept Entertainment Level featuring "rustic" wood-plank laminate floors, powder blue walls, floral pendant lighting, and creamy yellow "French-Chateau Inspired" kitchen cabinetry. While I considered this combination the uncontrollable design equivalent of Tourette's, what particularly rankled me were the oddly installed butcher block counters that arbitrarily extended quite far from the base cabinetry, forcing an odd install of the subway tile backsplash above it (see image on the left). This is sloppy, and poor design. 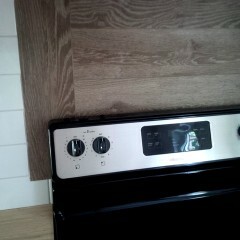 And then to our horror we saw - for good measure - that the flippers elected to add this misaligned ceramic 'wood plank' ceramic backsplash over the cooker as a "nice touch", thereby introducing yet another mismatched and colour-uncoordinated permanent fitting! 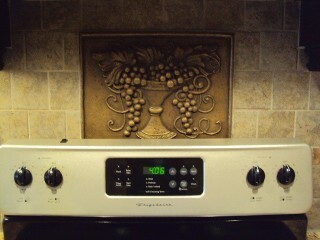 It's as bad as the flipper who installed this "Urn of Grapes" (hello, we live in a new millennium!) without taking into account the height dimension of this stove. These flippers have hedged their financial bet that the uneducated lacking any design sensibility will snap up this dwelling, all while turning off the swath of eager buyers seeking a property with 'character', 'style' or a 'professionally designed decor'. In their poorly executed visually-assaulting mediocrity they've alienated their most affluent and abundant target market willing to pay a premium for a property that has been customized and well-executed. Furthermore, in using easily identifiable materials and fittings - and then installing them poorly - we think it inevitable that most any well-informed consumer committed to quality will negotiate hard with these Flippers. In fact, the Buyers will be asking both for an abatement to remedy these design atrocities along with a financial penalty for 'pain and suffering'. For more on this, and how not to jettison a profit opportunity, check out this past blog called "I See Ya, Ikea". Are you trying to get Top Dollar for your Home? At urbaneer.com, we can guide you from start to sale as part of our sterling listing service, including FREE Style Enhancements! Want to know more? Just email Steve@urbaneer.com or call 416-322-8000! Like what you've read? Consider signing up in the box below to receive our FREE monthly newsletter on housing, culture and design, including our love for unique urban homes and other Toronto real estate. Have you seen Steven's newest site Houseporn.ca? It's his Student Mentorship site on Canadian architecture, landscape, design, products and real estate!